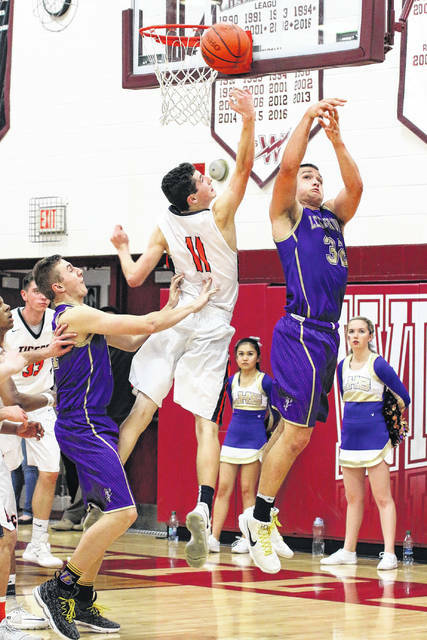 WILLARD — Lexington beat Galion 80-57 Wednesday to knock the Tigers out of the post season tournament. The Minutemen will play Clyde for the sectional championship at 8 p.m. Friday. Clyde beat Ontario, also on Wednesday, 78-64. Galion could not find an answer to the high-powered Minutemen offense. Lex used its size to dominate the Tigers throughout the first quarter and for the duration of the contest. After the first four minutes of the game, the Minutemen held a 9-2 lead over the Tigers and would wrap the first frame up 23-10. The second quarter was much like the first, although Galion did put up a little more offense. Lexington led 43-28 at the intermission. Leading the way for the Tigers at the half was Jack McElligott with nine points and Tristan Williams with eight points off of the bench. Cade Stover and Josh Aiello clocked in with nine points apiece for the Minutemen. Galion outscored Lex 19-18 in the third quarter, but trailed 61-47 starting the fourth, en route to the 23-point loss. Colten Skaggs and Williams led the Tigers with 11 points apiece. Zhamir Anderson scored 10. Other Galion stats on Wednesday were: Team- 17/34 from the interior, 5/18 from the perimeter, 8/14 at the free-throw line, 23 total rebounds (10O, 13D), 8 assists, 6 steals, 1 block and committed 16 turnovers; Skaggs- 3 rebounds, 2 assists; Williams- 5 rebounds, 1 assist, 1 block; Anderson- 4 rebounds, 1 assist, 2 steals; McElligott- 9 points, 1 rebound; Gage Lackey- 8 points, 5 rebounds, 1 steal and Nate Eckert- 2 points, 1 assist. Lexington had five players finish in double figures, four of which were starters. Stover, Nick Stehle and Aiello all finished with 13 points while Bryant Givand and Ben Vore each contributed 11 points. Stover completed his double-double by also grabbing 13 rebounds. Other stats for the Minutemen were: Team- 29/45 from the inside, 2/13 from the outside, 16/22 at the line, 38 total rebounds (16O, 22D), 11 assists, 11 steals, 4 blocks and committed 11 turnovers; Stover- 3 assists, 2 steals; Stehle- 2 rebounds, 1 assist, 3 steals, 1 block; Aiello- 6 rebounds; Givand- 2 rebounds, 1 assist, 3 steals; Vore- 6 rebounds, 2 assists, 1 block; Mason Kearnes- 7 points, 1 rebound, 1 block; Austin Basham- 5 points; Jacob Depperschmidt- 3 points, 1 assist, 1 steal; Kyle Johnston- 2 points, 3 assists, 1 block; Jack Dials- 2 points, 2 rebounds, 2 steals and Danny Shaffer- 1 rebound. Galion’s Jack McElligott finds himself in between two Lexington players scrapping for the ball during Wednesday night’s opening-round tournament action at Willard High School. The Minutemen would defeat the Tigers and end their hopeful tourney run; 80-57. Tigers sophomore Isaiah Alsip looks to make a move on Lexington defender Bryant Givand. 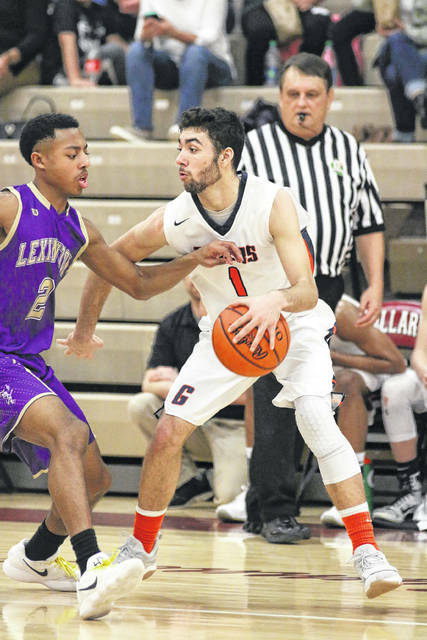 The Minutemen held Alsip to just six points during Wednesday’s opening round of the Division II Mansfield District tourney action as Lex moves on to play Clyde by defeating Galion; 80-57.